​We do what other shops cannot! Sorry we don't do tires, oil changes, or routine maintenance. Porting is the biggest bang for your buck because a better breathing engine is a key factor to more horsepower. The internal combustion engine is a big air pump, and the combination of parts comprising the pump are critical. The cylinder head of a four-stroke engine is made up of intake ports and intake valves, and exhaust ports and exhaust valves. This is how the air pump breathes. Camshafts actuate the valves, telling the head when to inhale and exhale. The fuel/air mixture enters through the intake ports and exits through the exhaust ports, so the shape of these ports greatly affect an engine's breathing characteristics. Mass produced stock motorcycles have cylinder heads with generic port shapes. The rough edges and casting marks left behind by the casting process hinder the performance of the engine, leaving horsepower on the table. The right combination of porting and valve work will increase horsepower while maintaining drivability and reliability. The bike remains streetable, while overall performance of the motorcycle is increased. 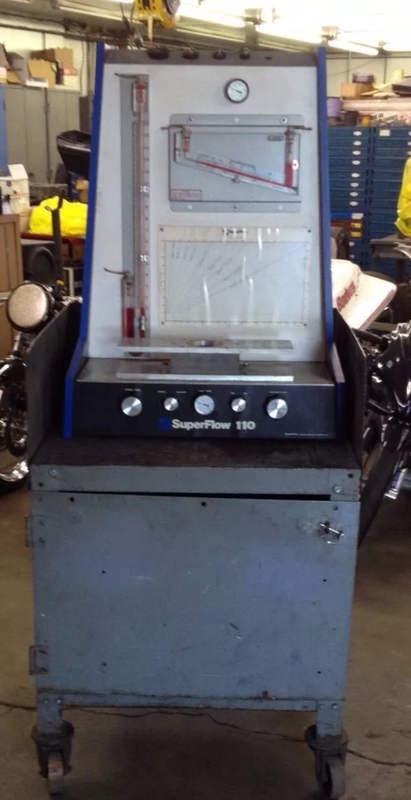 We are the only shop in the area with a COMPUTERISED SUPERFLOW 110 flow bench and engine building software so there is no guessing setting up your head and exhaust systems.